building material. Modern historians consider this legend to be close to reality, because Gorodezhkii was one of the owners of cement producing plants. So orders for the materials that followed after the House with Chimeras construction would be very profitable for him. 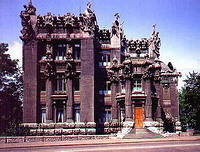 Gorodezhkii built the House with Chimeras for his family. He was very ambitious architect and did not want any other building to stand next to his house, so he decided to purchase two plots of land. One plot was intended for the house and another one was empty, but still the architect reached his goal, as nobody could buy that land and put up a building there. Nowadays this plot of land is occupied by stairs leading to Ivan Franko Theater.